we are pleased to present to you the following journal which might be of interest to many of us: The European Yearbook of the History of Psychology. Sources, Theories, and Models. 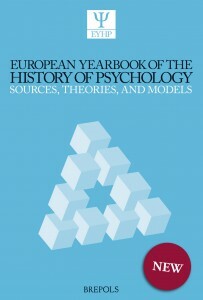 The European Yearbook of the History of Psychology. Sources, Theories, and Models (EYHP) is devoted to the history of psychology, and especially to the interconnections between historiographic survey and problems of epistemology. With an eye on the interdisciplinary nature of cultural studies, the Yearbook pays special attention to those common areas between psychological research and its adjacent disciplines, in particular the human and the life sciences (philosophy, sociology, anthropology, psychiatry, physiology, neurology, biology, zoology, etc.). Aimed primarily at historians and philosophers of psychology, epistemologists, historians of philosophy, and historians of human sciences, the Yearbook is also open to contributions from all areas of psychology that address a phenomenon or topic of interest in psychology from a historical perspective and/or with an epistemological approach. Besides original essays, the Yearbook encompasses the following sections: Unpublished and archival material; Discussions (a space where authors can confront one another and discuss specific topics); Interviews; Book reviews and reading recommendations.